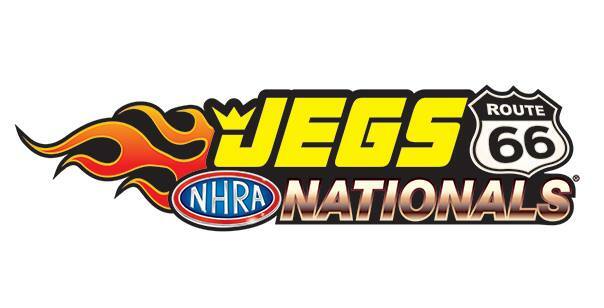 JEGS, one of the largest high performance automotive equipment retailers in the United States, has reached an agreement with NHRA as the title-rights sponsor for the NHRA Mello Yello Drag Racing Series event taking place at Route 66 Raceway outside of Chicago. The JEGS Route 66 NHRA Nationals will take place on May 31-June 3 and will feature competition in all four professional categories. The entitlement builds upon the involvement by the organization as the JEGS Allstars specialty race will take place on Saturday, June 2. This race-within-a-race will pit the top points earners from NHRA’s seven geographic divisions of the NHRA Lucas Oil Drag Racing Series and four Top Alcohol regions against each other in the culmination of a yearlong points battle. Competitors in Top Alcohol Dragster, Top Alcohol Funny Car, Comp Eliminator, Top Sportsman, Top Dragster, Stock Eliminator, Super Comp, Super Gas, Super Stock, and Super Street will compete for team and individual honors as well as a share of the $124,000 purse. The JEGS Route 66 NHRA Nationals is the ninth of 24 events on the NHRA Mello Yello Drag Racing Series. It will be televised on FS1 and is the first of four consecutive events, which could prove critical for NHRA teams chasing title aspirations. Route 66 Raceway features the first true stadium of drag racing and has witnessed impressive performances by the top racers in the sport.